The Fitbit Flex 2 arrived in late 2016 as an update from the original Flex model. Comes with the same style that the Flex but add more customization and we are glad to say that is Waterproof! so you can submerge this tracker and get data from your swimming activities. This Flex 2 is one of the most affordable trackers on today’s market at only $59.00 on Amazon. You can choose between a number of bands and colors to have a different looking tracker for any type of occasions. Although not every aspect has been improved, with the 5 days battery life being a disappointment since is 2 days less than the regular flex. So it’s the Fitbit Flex 2 good enough for your wrist?. Keep reading while we give you the most detailed review about the Flex 2. The Fitbit Flex 2 is a solid choice for those after something simple, as well as those who are in need of a water-resistant tracker. It’s smaller and sleeker than the original, but at the cost of battery life. We are more positive about its core feature and that’s the swim tracking. Yes, it is basic, but it serves up a better swimming experience than similarly priced trackers. 3 Fitbit Flex 2: Finally a Waterproof Fitbit! If you think that the original Flex was slim the Flex 2 comes to change your perspective cause is even slimmer than his predecessor, exactly 30% smaller and without a display. It is one of the lightest and more comfortable trackers out there that you can easily wear all day around without even notice that you have it on. The Flex 2 is available in different color bands including black, magenta, lavender, and navy, so you’ll easily be able to find the one that suits you best. The band now comes with a textured pattern, which makes it less plain than it would otherwise be, but it doesn’t feel coarse against your skin. You’re supplied with 2 different-sized bands as standard. Additional classic bands minus the tracker are available in a larger variety of colors. There are far fancier options available as well you can switch out the original bands for bangles, pendants and a whopping selection of seven Classic bands. 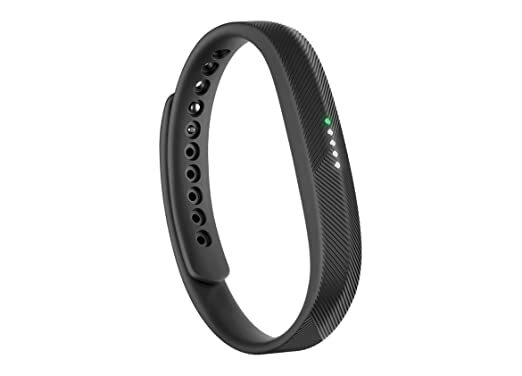 The tracker is pretty secure to wear as well, the Classic band comes with a softly textured elastomer but not so pliable that you’ll be able to clasp it easily. One of the biggest criticisms of previous Fitbits models has been the suitability of the clasp mechanism. You always have the doubt if that the tracker will stay always on. But they add a really secure clasp on the Flex 2 so is going to maintain pretty secure to your wrist. Is true that is going to be a little bit more difficult to get rid of the tracker in a hurry, but the tracker is pretty secure and that is something that we like about the Flex 2. The colors you can choose from in the Classic collection are: black, magenta, navy, grey, lavender, pink and yellow. There are also available on Amazon different packs of 3 bands that you can get for just $29.95, the Sports Pack (navy, grey and yellow) and the Pink Pack (pink, magenta, and lavender ). The classic band alone cost just $14.95. The fancier options include Luxe bangles in silver ($89.95), gold and rose gold ($99.95). Then there are the pretty little pendants that come in silver ($79.95) and gold ($99.95), with a one size 17-inch chain. The Flex 2 is a pretty simple tracker with the capacity of tracking your steps, active minutes, calories burned, hourly activity and sleep, all of which can be auto-detected thanks to the SmartTrack feature. You can track different exercises like walking, running, outdoor bike rides on pavement, elliptical, aerobic workouts (Zumba or cardio kickboxing) and sports like tennis, basketball and soccer (among others according and all auto detected so you don’t need to tell your tracker what activities are you performing. Alotuhg you need to use the app to check how many steps you’ve taken and to measure specific numbers for goals, but tapping on the front of the Flex 2 will make light depending on your achievement. Each white light represents 25% of your goal, so if your goal is 5,000 steps and you see 2 white lights, you’ve completed at least 2,500 steps. When you achieve your goal, the tracker will vibrate and will flash in ‘celebration’. If you tap once again the tracker will stop the celebration and continue to track your fitness levels. Beside from the swimming tracking abilities that we will talk about below. The running tracking is pretty accurate as well but there’s something that you won’t get with this tracker and that is advanced metrics since the tracker doesn’t come with GPS built in you won’t get the most specific metrics. The workout duration is a few minutes off. When it comes to checking your calories expended the tracker is pretty accurate. Unlike the Charge 2, there’s no heart rate monitor or connected GPS, which means you won’t get running distances even if you take your phone along for the ride. Fitbit Flex 2: Finally a Waterproof Fitbit! The Flex 2 was the first tracker from the company that appears with the swimming proof feature ( Now they have the Ionic as well). You can submerge the Flex 2 up to 50 meters (about 165 feet) and can be used in fresh water and salt water as well. There some things to have in mind, when you want to use the swimming tracking features you need to enable the swimming mode in the Exercise section of the app. You also need to turn on the swim track feature before you get in the pool. By default, the feature is turned off to preserve battery life and for those that don’t wish to track their swimming activities, so be sure to turn this options on before you get your swimming on. The Flex 2 will give you data of your calories burned in a chart, the amount of time you’ve swum, distance, pace and the daily impact. You can also set the pool size to get the most accurate tracking as it seems to be set to 25-meter pools by default. You need to understand that you won’t get the most detailed metrics, with the Flex 2 you are going to get a basic track of your movements during your swimming, although is pretty accurate and precise with the metrics that will retrieve and unless you are a pro swimmer you are going to be pretty comfortable with the metrics from the Flex 2. Lest be realistic here the addition of the swim tracking is huge in itself. If well doesn’t have the sophisticated metrics that can come with higher-end fitness trackers like the TomTom Spark or the Garmin Vivoactive models, the Flex 2 will cost you at least 5 times less and you’re still getting a good tracking experience. The app that comes with the flex is the same one that Fitbit uses in all its devices. It’s a great ecosystem, full of social challenges and badges to win, all in a really easy to use dashboard. When the Flex 2 appear on the market just like the Charge 2 they bring a set of new challenges called Adventures, you can choose from various step goals that take you through different locations. For example, if you wanna do the Yosemite Vernal Falls hike it will take you 15,000 steps to finish it. So you are going to have a hike match up with your daily routine, meaning that every step you’re taking at home, work, wherever is going to appear to you compared with the hike the app gives you. You even get to see your steps mapped out with the app telling you how many more steps you need to go. You don’t have to complete the whole goal immediately, although the app will give you a daily destination with points to meet based on your 7-day step average. While you are reaching different milestones the app will unlock different rewards to keep you motivated. Aside from that, you get your usual gamut of food, water, and weight logging. Days are presented on the main screen, and you tap a metric to get a broader look at your performance. For example, tap on the sleep score for the day and you can take a look at your sleep over time, and filter by day, week or month. Overall, Fitbit’s app is one of its strong points. Easy to use and clear, it offers enough data without feeling overwhelming. You can also sync up multiple devices to one phone. In the past it didn’t always work right, and you’d have to un-sync, re-sync and go through a whole process but now it works like a dream. The SmartTrack mode will start by itself at some point of your exercises like longer-duration walks, cycling, running, and of course swimming. You can configure when SmartTrack starts through the app. The app was updated with a community tab, that comes with an extra push to the social elements of fitness through new sections. You’ll be able to connect with friends and family as you would expect, and share inspirational moments and compare progress. You’ll also be able to tailor your personal goal and identify your focus areas such as steps or getting better sleep. There’s a survey that you can do to help identify your motivation and then get customize recommendations based on your goals and historical data captured by your Fitbit. You’ll also be able to find like-minded people in the Groups section relating to topics such as fitness, wellness, weight loss, and nutrition. Fitbit will also provide you with different content written by health and fitness experts. The Sleep tracking features are also super accurate and provide you a useful analysis to understand your different stages of sleep during the night. Having in mind that you don’t need to take the tracker off when you wanna take a shower is a big plus, but the fact that you don’t need to charge the Flex 2 on a regular basis is also a bonus. Having said that the tracker offers a 5 days battery lifespan, so there’s a lot of trackers out there that can do the same or better than this. If you turn off notifications and only used it for activity tracking you can get up to nine days. It’s clear that with notification support, activity tracking and swim tracking all switched on, it does mean the battery takes a hit. To charge the tracker you need to simply remove the tracker from the band or accessory you’re using, and placing it into its USB charging cradle. The full charge will take around 2 hours is kind of an odd point for such a small tracker. Some heads up about the charging with the USB try to be sure to pay attention how the Flex 2 clips in place into the cradle. If you place it incorrectly you can be waiting to get an uncharged tracker. The Flex 2 is a great improvement from the original Flex, with the addition of waterproofing making it a much easy to use and a great companion for your workouts even if you’re not a regular swimmer. Not having to take it off every time you need to take a shower is a convenience you shouldn’t overlook. Comparing with all the Fitbit models the Flex 2 is the most affordable tracker at just $59.00 is a pretty hard to beat price, and even more having in mind that is waterproof up to 50 Meters. Some downsides that we found is that if well can track your overall fitness metrics the hardware that comes along is extremely basic, amounting to step and swim tracking – that’s it – but the Fitbit software is clever enough to weave motivating narratives out of the data to keep you interested. So there some good and bad points about it but the swim tracking is something that we like, if well is a basic track will help you to get a better understanding of your swimming workouts. The SmartTrack mode is a cool addition but again delivers very basic information. So if you would like to have a track of your swimming sessions and can live without the more advanced metrics of a dedicated swimming watch, then the Flex 2 is a great buy.